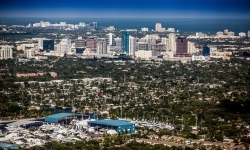 The Greater Fort Lauderdale Chamber of Commerce is actively involved in efforts to combat sea level rise, and maximize resiliency in all arenas to ensure continued prosperity throughout the region. Our Coastal Resiliency Committee researches and strategizes action plans to tackle sea level rise, which will affect all areas of our region. Additionally, the Chamber is part of the South Florida Regional Climate Change Compact, a collaboration between municipalities, academic institutions, government agencies and nonprofit organizations to forge a greater public-private partnership on this issue. The information on this page will be routinely updated with the latest data.